Welcome to Arturus, a once-peaceful whose princess has been captured and taken to the depths of space. You must find the princess and rescue her from the clutches of an evil sorcerer. Arturus is relying on you! 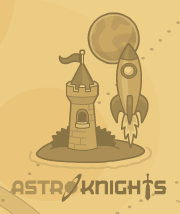 Go to Astro-Knights Island if you are not already there. You will arrive on Main Street. When you arrive on Main Street, go right until you see a water fountain that is shaped like a spaceship. There will be something gleaming in the top part of the fountain that is filled with water. Jump up and get it. It is a golden coin. Now, go left to the building that you passed on your way to the fountain. That building is The House of Mordred or Mordred’s Museum. Go inside the building. There will be a man standing to your right. Click on him to talk to him. He will tell you that admission to The Museum of Mordred is one gold coin and to come back when you can pay. He will also give you a museum pamphlet. Go to your items and find the Golden Coin’s item card. Click the button that says “Use” on the coin’s item card. You will give the golden coin to the man that is standing next to you. He will tell you that you are free to look around. To the right of the man standing next to you, there are some books that are stacked on a table. Click on the books. The man will tell you that the books must stay where they are. He will give you an old Library Book Slip. Exit the museum, and go all the way right until you see a castle. Enter the castle through two large, wooden doors. Once you are inside the castle, go right until you see a small wooden door. Go through the door. You will be inside the castle’s library. There are two books that you can get in the library. To get the first book, The Mystical Weapons of Arturus, go all the way left until you see a green book on a shelf. Jump up to get the book. To get the second book, The Life of Mordred A Cautionary Tale, go back to the right until you get to the place in the library where there are a few steps. Go down onto the lower level of the library. Go left until you see a red book on a small stand. Jump up to get the book. Once you have gotten both books, you should see a shelf that has a section labeled “McM”. You should see, on the wall behind the section, a brick that is differently colored than the rest of the bricks. Click on the brick. Some tiles on the floor will sink down, forming a secret stairway. Go down the stairs. You will end up in a room that looks like a dungeon. There will be a plate of old cheese on the floor to your right. Walk over to pick it up. Once you have the cheese, go right until you see a lever on the wall. Click on the lever to pull it. Pulling on the lever will open a grate that is to your right. You will also see a strange looking robot. Click on the robot, and a bunch of 0’s and 1’s will appear. Once you have done that, you can head back up the stairs. When you are back in the library, there will be two guards and the librarian waiting at the top of the stairs. The librarian will tell you that you had no business snooping down in the dungeons. Exit the library. Once you are out of the library and back in the castle’s halls, go left until you see a small wooden door like the one that goes to the library. Go through the door. You will find yourself in one of the maids’ room. Click on the maid to talk to her. She will tell you that she fears that she played a part in the princess’s kidnapping, that the princess was using her to send messages to a secret society, and that she would leave the messages on the fountain in the square. Once you are done talking to the maid, go to the left a little bit, and you should see a mechanical mouse go back-and-forth on the floor. Go to your items and find the Moldy Cheese’s item card. Click the button that says “Use” on the item card. You will put the cheese on the ground and the mechanical mouse will go to it. The mechanical mouse will be added to your items. Once you have the mechanical mouse, look a little to your right, and you should see a letter that is sitting on a chest. Go over to the letter to get it. The letter is a secret message. Once you have the message, exit the room. Once you are out of the room, go up the stairs and go through the small, wooden door. Once you are through the door, go right until you are in front of three thrones that are on a sort of platform. The King and Queen are standing on the platform, by their thrones. Another man will be standing to your right. Click on the King to talk to him. He will tell you that the invaders attacked the castle and made off with their beloved daughter, that the invaders took the princess “to the fabric of the sky, and beyond!”, and that if you bring back the princess you will be knighted. Click on the Queen to talk to her. She will tell you that the invaders came from the sky in flying machines and that they had weapons of frightening power; that she didn’t know why the invaders took the princess, but the princess had been acting strange lately; and that three knights went to try and find the princess. She will give you an item called “Coordinates” that the knights left. Finally, click on the man that is standing below the thrones and talk to him. He will tell you that they fear that the three knights who set off to find the princess are lost as well. Once you have done all that, exit the castle. Once you are outside the castle go all the way right until you reach a man that has a shovel in his hand. Click on the man to talk to him. He will give you a bag of manure. After the bag of manure has been put in your items, go right, jump over the hay bales, and keep going right until you see a windmill. The windmill is called “Ye Olde Rumour Mille”. Enter the windmill. Once you are inside the windmill, go left a few steps and you will see some hay bales. Jump up onto them. From there, jump up onto the shelf that is next to you. After you have done that, jump up onto the top of the two wheels that are on the platform above you, from there jump up onto a platform to your right, and walk to the left a little bit. You will notice a rope hanging down from a rusty-colored rod. Jump and grab onto the rope. That will make the rod that the rope is connected to lift up. After doing that, slide down the rope and land on a platform beneath you. A woman who is dressed in black will be next to you. Click on the woman to talk to her. She will tell you that if you tell her your secret, she will tell you hers. You will give her the Secret Message. She will then tell you that she can see that you are a member of the order, and she will give you the password for entrance. She will give you a piece of paper that has three cosmic symbols drawn on it. The Cosmic Symbols will be put in your items. Jump off of the platform and exit the windmill. Go to the right until you are on the edge of the ground. There will be a wheel next to you, and on the top of the wheel there is a coil of rope. Jump on top of the wheel to get the rope. Jump off of the wheel, and go left until you are underneath the sign that says “Ye Olde Rumour Mille”. Jump on top of the sign. From there, jump onto one of the windmill’s sails. When you jump on the sail, you will make it move. As the sails move, they open a glass portal on the top of the windmill. Keep jumping from sail to sail, until the glass portal is open wide enough for you to enter. Jump on top of the windmill, and enter through the portal. You will find yourself standing on a pile of hay bales. Leaning up next to the hay bales is a hovercraft. Go to your items, find the Bag of Manure’s item card, and click the button that says “Use”. You will put the manure inside the hovercraft and it will float up and out of the windmill. Exit the windmill, and get back onto the ground. Go to the left until you get to the castle. Go to the wooden doors of the castle and stand in front of them. From there, jump onto one of the windowsills that are on either side of the doors. After that, jump onto the platform that is directly above the doors. There will be a giant bow and arrow and one knight on the platform. Go to your items, find the Coil of Rope’s item card, and click the button that says “Use”. You will put the coil of rope onto the giant bow and arrow. Click and hold on the giant arrow. To aim, move your cursor up and down. Aim to the top-left corner of your screen. Release your mouse to fire the arrow. If you aimed right, the arrow should hit a door in a tower (if you missed, don’t worry, you can try again). The arrow will take the rope with it, making the rope stretch out like a tightrope. Jump onto the rope and walk across it. Enter the door at the end. You will be in the princess’s bedchamber. Walk to the left until you see a trunk. There will be a piece of paper sticking out of the trunk. Get the piece of paper. It is a note from the Princess. Read it. It will say: The order believes the Great Inventor kept many of his secrets under his bed, but the order dare not come out of their hiding place to seek them. I will do my best to aid them in my search, because I believe Mordred is alive! I’ve detected a beacon on a faraway planet, and I believe it may have come from him. I have sent a return signal, and… That is where the note ends. Once you are done reading the note, go back outside. Go left until you get to Main Street. Once you are on Main Street, go left until you get to the water fountain. Walk into the middle of the bottom part of the fountain, and click on the part of the fountain that has planets, stars, and the sun on it. First, click on the crescent moon. Second, click on the planet that looks like Saturn. Third, click on the star that has five points. Finally, click on the sun. After you do that, all the water will drain out of the fountain, and the part of the fountain that you clicked on slides down, revealing a secret passage. Enter the passage. You will find yourself in a cave-like room. There will be five people, all in purple cloaks in the room. Find the boy with the brown hair and click on him to talk to him. He will give you a small key. He will tell you that they found the key in Mordred’s house, but that they do not know what it goes to. Once you have the key, go back outside. Go left, and enter Mordred’s Museum. Go upstairs and walk over to the bed. Click underneath the bed. You will get a missing page from Mordred’s journal. The page says, “I have found a nearby moon with much activity that I believe to be alien life! I have found that animal waste makes decent fuel, and there is just enough manure in Arturus to bring my flying craft to this moon. The star coordinates are 56, 52”. Go right until you come to the man who gave you the manure. A little to the right of the man are two hay bales that are side-by-side. Jump onto one of the hay bales and walk over to the small crack between the hay bales. You will fall through, pushing the hay bales a little to the side. Push each hay bale as far as you can push it, revealing a trap door. Go to your items, find the Small Key’s item card, and click on the button that says “Use”. You will unlock the trap door. Go down through the trap door. You will find yourself in Mordred’s Hideout. There will be a mechanical owl that is perched on something in Mordred’s Hideout. Walk over to the owl to cause it to fly out of the hideout. Exit Mordred’s Hideout. The owl will be flying bedside the hay bale to your right. Go to your items, find the Mechanical Mouse’s item card, and press the button that says “Release”. The owl will go after the mouse, eat it, and will become your friend. The owl will now follow you wherever you go. The owl’s name is Merlin, it is the same owl that was in the book, Mordred, A Cautionary Tale, that you got from the castle’s library. Go back down trough the trap door and into Mordred’s Hideout. Walk left until you see a book with a big “M” on it. The book will be resting on a chair. Get the book. The book is Mordred’s Journal. Once you have Mordred’s Journal, walk a little more to the left. A wall will be blocking your way to a tunnel. Push on the wall until it crumbles. Go to the end of the tunnel. There will be a small, dark hole on the side of the tunnel. Go through it. You are on the opposite side of the dungeon that you were in when you went down the steps in the library. You will also see the same robot that you did. When the robot sees you, it will self destruct, and a green tube will fly away from it and land on the other side of the bars. Walk over to the bars, click on Merlin, and then click on the green tube. Merlin will get the green tube for you. You have now received a Fuel Rod. Go back through the hole and into Mordred’s Hideout. Once you are in Mordred’s Hideout, leave it by climbing back up the rope. You will find yourself in between the two hay bales. Jump over the hay bale on your right, and continue going right until you reach the edge of the ground. The hovercraft will be floating by the ground. Jump onto the hovercraft. You can steer it by using your mouse. Just move the mouse in the direction that you want to go, and the hovercraft will float in that direction. Go right until you come across a UFO that is stuck in the mud. The UFO’s name is Excalibur. Click on it. You will be shown a control panel. Below some dials on the control panel, there is a broken fuel rod. Your fuel rod will be on the bottom left-hand corner of the screen. To replace the broken fuel rod with your fuel rod, just drag your fuel rod over to the broken fuel rod. Now, you have to go somewhere in Excalibur. So, enter the coordinates 56, 52, the coordinates of the moon that Mordred mentioned in the page from his journal, into Excalibur’s system by turning the dials that are above the fuel rod. Once you have entered the coordinates, press the button that says “Launch”. Excalibur will blast off into space. Your flight will be going smoothly until, right before you reach the moon, you run out of fuel. The result: a crash landing onto the moon. You will find yourself standing next to a sign that says “Welcome to Pewter Moon”. Also, Excalibur will be next to you. But, it is completely destroyed. You won’t be flying it anytime soon. Go to the right a little bit, and you will see an alien. If you talk to him, he will welcome you to Peweter Moon. Keep going right until you see a small platform that is floating up and down. When you were going to the right, you should have passed a small metal-launch-pad-type-thing. To the right of the launch pad is a sign that says “Create Your Own Rocket”. Jump up onto the platform (this planet has less gravity, so you can jump higher than you could before). Once you are on the platform you will see a doorway that has two doors in it. From the platform you should be able to jump up there. There will be an alien to the left of the doors. Click on the alien to talk to him. He will tell you that he is keeping an eye out for the Binary Bard, and that he attacked the aliens once and that he was probably going to do it again. When you ask who the Binary Bard is, the alien will tell you that the Binary Bard is a powerful sorcerer. The alien will tell you that the Binary Bard attacked them to steal their technology, and he will tell you that some people say that “he is creating fearsome machines to carry out his evil plans”. The alien will also tell you that some say that Binary Bard created a fortress on a mysterious planet. When you are done talking to the alien, enter the building by going through the doors. You will see an alien standing to your left. Click on the alien to talk to him. You will ask him if he can fix Excalibur, but he says that there is not a chance of fixing it. When you ask to borrow a ship, the alien refuses to let you borrow a ship, he says that the last time he let a human borrow a ship, he never saw it again. When you ask him how you can get off of the planet, he will tell you that if you let him have your ship for scrap, he will let you build a new one on the holopad. Exit the building. Go back to the metal-launch-pad-type-thing. Click on the holopad that is floating beneath the sign. You will be brought to a screen where you can create your own rocket ship. To create it, click on a part of the rocket ship, such as the wings, and you will be able to go through different styles of the wings. Each type of wing has a different speed level and a different shield level, and that is the same with the rest of the parts of the rocket ship. You can also change the color of something by clicking on the color that you want it to be. Once you are done designing your rocket, click the button that says “Done”. Your rocket ship will appear on the launch pad beside you. When you are ready to continue your adventure, enter your rocket ship and pull the lever that has a sign that says “Launch” underneath it. To fly your rocket ship, guide it with your mouse. To shoot balls of energy. You can tell the coordinates of where you are by a small icon on the bottom left-hand corner of your screen. If you press the button above the icon that says “Teleport Home”, you will be teleported to Pewter Moon. To land on a planet, click on it. To see how much shield you have left, look at the icon that is next to the other icon and the “Teleport Home” button. If anything new happens to you, such as if you get hit by an asteroid, a message will appear on a bar that is next to the shield icon. You can also access the coordinates that the Queen gave you by an icon on the bottom right-hand corner of your screen. Point your cursor toward the upper left-hand corner of your screen and fly in that general direction until your coordinates read 15,15. When your coordinates read 15, 15, you will be flying over a planet that looks like a jungle. Land on the planet. Exit your spaceship. You will find yourself on a platform in the middle of a jungle. Jump off of the right-hand edge of the platform. You might land on some mechanical-looking flowers, but just jump off of them until you get to the ground. Go right until you see a green and silver lance lying on a pedestal. Jump up to get the lance. The “Laser Lance” will go to your items. Go to your left until you see one of the mechanical-looking flowers that is close enough to the ground that you can jump onto it. When you jump onto it, it will act as a springboard and it will send you flying into the air. Use the flowers to get back to the platform that your spaceship is on. To your right, there will be a small platform swinging back-and-forth. When it gets close enough, jump onto the platform (note: There are some caterpillar-like bugs hanging from the trees. Be careful not to touch them, because, if you do, they will send you flying). The platform will meet up with another swinging platform. Jump onto the second swinging platform. From the second platform, jump onto a third swinging platform. From the third platform jump onto another platform. Go to the right until you see a knight in green armor. Click on the knight to talk to him. He will tell you that his name is Sir Cador, that he was charged with finding the princess, and that he has failed to find her. He will tell you that he cannot get past the phoenix birds. He will also tell you that someone or something is being held in the cage (which is up high to the right, so you can’t see it), and that you should use the Laser Lance to open up the cage. Climb up the rope that is next to Sir Cador. Wait for the first phoenix’s egg to be closed, and jump on it. From there, jump onto the second egg; then the third; the fourth; and, finally, the cage. Try not to stay on the eggs too long, because, when the phoenix springs up, you will be sent flying. Also, try not to hit any of the phoenixs’ beaks; they’ll send you flying, too. When you reach the cage, you will see that there is a unicorn in there. Click on the cage to blast it open with your Laser Lance. When you click on the unicorn, Sir Cador will warn you the the Mother Phoenix is coming. When you battle the Mother Phoenix, you will be riding a unicorn. There are three things you need to avoid: bugs, missiles, and storm clouds. For missiles and storm clouds, you can only dodge them. But, for bugs, you can either dodge them or shoot them with your Laser Lance. To shoot the laser lance, either click to make a small laser or hold and then release to make a big laser. Here is what you do when you actually start battling the Mother Phoenix: when she opens her mouth shoot her with a fully charged laser and make sure you dodge the missiles that she launches. When you have done that three times, the Mother Phoenix will be defeated! Once you defeat the Mother Phoenix, Sir Cador will tell you that he will accompany you on your journey. You will be brought back to your spaceship. Launch your spaceship and fly until you get to a place where your coordinates are 83, 20. When your coordinates are 83, 20, you will be floating over a fire planet. Click on the planet to land on it. Exit your spaceship. You will be standing on a mound of rock that is sticking out of the lava that is on the surface of the planet. There are floating platforms to your right. Jump onto them until you get to the top of a volcano. Be careful not to fall in the lava, because, if you do, you will have to star all over again. Once you are on top of the volcano, go into it. You will find yourself in a tunnel. Every few seconds, gas from the volcano will blow through the volcano’s tunnel. You have to get through the tunnel without getting swept away by the tunnel. There are small ledges and holes that the gas doesn’t go into. You can use those to help get through the tunnels. Here is what to do: as soon as the gas stops blowing through the tunnel, sprint until you get to the next ledge, hole, etc. Keep doing that until you get to a small tube-like thing that the gas is blowing out of. Once you get there, jump down and go to the left until you find yourself face-to-face with a creature that looks like a bunch of rocks with an eye on each rock. To get past this creature, just jump over the creature and try not to let it hit you. Keep going left once you have jumped over the creature. You will eventually see a knight in red armor. Click on him to talk to him. He will tell you that his name is Sir Pelleas and that he was charged with finding the princess, but that he has failed. When you ask him why he has failed he will tell you that he was bested by the beast that lives in the cave. Sir Pelleas will also tell you that he believes that the princess is being held captive in the cave. He will give you an Ice Arrow and ask you to defeat the beast for him. Go left to enter the cave. Your goal: defeat the monster using the Ice Arrows without getting overheated (you can get overheated by being hit by fireballs). Your body temperature will slowly rise even if you don’t get hit, so you have to do this really fast. Here’s how you defeat the monster: climb up the first chain, jump from chain-to-chain until you get to the end of the chains, jump down (make sure you avoid the iron ball that has spikes on it), jump onto the monster, pull the lever (which makes the monster become still and open its mouth), run forward, use an ice arrow to shoot the monster in its mouth, and start this whole process over again. Once the monster is hit with the arrow, it will start jumping up and down, and it will cause sharp rocks to fall down, so make sure that you avoid getting hit by the rocks. Once you defeat the monster it will roll forward a tiny bit and fall down. Sir Pelleas will come running in, and he will tell you that the Binary Bard tricked you and that the princess isn’t there. He will also tell you that he will come with you to find Binary Bard. The next planet that you will be going to is the Ice Planet, and the coordinates for this planet are 73, 83. Fly until you almost get to those coordinates and you can see the planet. You will see that the planet is guarded by space sharks. There is a black hole nearby (the coordinates of the black hole are around 82, 52). Here is how to get rid of the space sharks; you are going to lead them to the black hole, where, when you get almost too close to it, you will swerve to the side, and the space shark will go into the black hole. Make sure you are eaten by a space shark or pulled into the black hole, because you will be transported to the moon if that happens to you. To get the space sharks to follow you, circle the planet until you attract one of their attentions. Then fly toward the black hole, but make sure the space shark keeps following you. There are three sharks, so you will have to do this three times. Once all of the space sharks are destroyed, land on the planet. You will find yourself on an icy ledge. There are pieces of ice that are floating in the water to your left. You will have to jump from piece to piece to get to the icy ledge that is on the other side of the water. It’s not just as simple as jumping from piece to piece, though. One thing is that the ice is slippery, so if you are not careful you will slip, fall off the piece of ice, and into the freezing water. Another thing is that, like I said before, the water is freezing, so, if you fall into it, you will have to start over again. Finally, there are fish swimming in the water who will jump up and try to hit you, which might make you fall into the water. One tip is to try to jump from piece to piece quickly, but it’s mostly a matter of luck. If you have trouble with this part, don’t worry, you’ll get it eventually. Once you get to the other side, keep going right. The next thing you have to do is to jump up to the top of the ice-mountain. To do that you have to jump from ledge to ledge. Again, the ice is slippery, so don’t slip off of a ledge. Also, you will have avoid snowballs that are rolling down the ledges, because they can knock you off. When you reach the top, you see a knight who is wearing blue armor. Click on him to talk to him. He will tell you that his name is Sir Gawain. He will tell you that he was charged with finding the princess, but that he had failed. When you ask why he has failed, he will tell you that he was bested by a beast who he believes is guarding the princess. He will give you a force shield and he will tell you to defeat the beast using it. Here is how to defeat the beast: use the force shield to bounce the snowballs that it shoots back to it. When you hit it with one snowball, it will start flashing red; it will fly down closer to the ground; and it will shoot a big snowball at you, which you need to jump over. Every-now-and-then your shield will need to recharge, and when that happens, don’t let anything hit you. Do this three times and you will defeat the monster. Once you defeat the monster, Sir Gawain will tell you that the monster wasn’t guarding the princess after all. He will also tell you that he will accompany you on your quest. You will be transported back to your spaceship. Click on one of the knights to talk to them. The knight that you clicked on will tell you that there is a legend that says that there is a golden key on a large asteroid that opens up a gateway to another galaxy. Launch your spaceship. Head toward the left until you get to the coordinates 11, 82. There you will see the Crystal Gate. Click on the Crystal Gate to land on it. When you land, exit your spaceship, and then start climbing up the crystal by jumping on pieces of it. You can jump higher than you could normally, because there is less gravity on the asteroid. When you reach the top of the crystal, the three knights will be there. There will also be a key embedded in a piece of crystal. There is an inscription above it. The inscription says this: When four knights of the Quest are gathered the Chosen One may pull the key from the stone. Click on the key to pull it out of the stone. The key will float up and start spinning, making a spinning spiral that you can go through. Click on the spiral to go through it. You will find yourself on a fortress. Jump down until you reach the ground. Walk either to the left or right (depending on which way you jumped down) until you see a princess standing in front of what looks like a bunch of tiles. Click on the princess to talk to her. She will tell you to give her the three weapons to destroy the place. You will give her the weapons. She will suddenly transform, turning into Binary Bard. Oh no! You’ve been tricked! He will tell you that with the three weapons he can create an ultimate energy source, and, then, he will disappear. You have to stop Binary Bard! Click on the thing that looks like a bunch of tiles, and you will find that it is a puzzle. You have to make a picture out of the tiles. To do that you have to flip them over. But the trick is, certain groups of tiles turn over when you click on a certain tile. Here is how to complete the puzzle: in your head, label the rows (going from top to bottom) 1, 2, 3, 4, and 5; click on the third tile in row 2; click on the fourth tile in row 2; click on the first tile in row 2; click on the second tile in row 2; click on the second tile in row 3; click on the third tile in row 3; click on the fourth tile in row 4; click on the third tile in row 4; click on the second tile in row 4; and click on the first tile in row 4. Once the picture is complete, you can go through it by clicking on it. After you click on it, you will find yourself in a room with the real princess and Binary Bard (Mordred), who is inside a machine. You have to defeat Binary Bard. Binary Bard will start talking, and right in the middle of him talking, Merlin (the mechanic owl) will appear. You will start out using Merlin. Dodge the things that Binary Bard throws at you. He will start dropping circular bombs onto the floor. The bombs will start flashing when they are about to explode. Pick up one of the bombs and drop it onto Binary Bard’s machine. Try to time it so that it explodes right as it hits him. Once you hit Binary Bard twice, he will shoot Merlin down (don’t worry, though, he will be okay). For the next part, you will be yourself. Get up onto the platform that the princess is on by jumping up onto the top of Binary Bard’s machine and, from there, jumping onto the platform. There are two chandeliers on the side of the platform, one on the right and one on the left. Jump onto the chandelier and wait there for Binary Bard to go underneath it. He will shoot at you using a laser, but it will hit the chandelier instead. The chandelier will fall down on top of Binary Bard and hurt his machine. Do that twice and Binary Bard’s machine will be destroyed. Binary Bard will try to take the energy orb, but the princess (who escaped when Binary Bard’s machine was destroyed) will stop him. You will be transported back to the castle, and the king will give you the Island medallion and 100 credits to spend in the Poptropica Store. Congratulations, you have completed Astro-Knights Island!